The Prime Minister announced a byelection in the Burnaby South riding on Wednesday January 9th. The riding was previously held by former NDP MP Kennedy Stewart who vacated the seat after a successful mayoral bid for the City of Vancouver. NDP Leader Jagmeet Singh was first to announce on Aug. 8, 2018 that he will run in the byelection in the riding of Burnaby South. The ridings liberal candidate Karen Wang, a daycare operator, became the subject of controversy on Tuesday night after she posted a message on the social messaging app WeChat that urged voters to support her as the only candidate of Chinese origin. Wang has now apologized for her comments and announced her decision to step aside. “I’ve been proud to call Burnaby South my home since I arrived in Canada as a newcomer twenty years ago. The diverse character of this community is a real source of strength, and diversity enriches all of us as Canadians,” she wrote in the statement. “After consideration with my supporters, I have decided to step aside as the Liberal candidate in the Burnaby South by-election,” she wrote. Liberal Party of Canada said her comments did not fit the values of the party. “Recent online comments by Karen Wang are not aligned with the values of the Liberal Party of Canada. The Liberal Party has accepted her resignation as the Liberal candidate in the Burnaby South by-election,” Braeden Caley, senior director of communications. 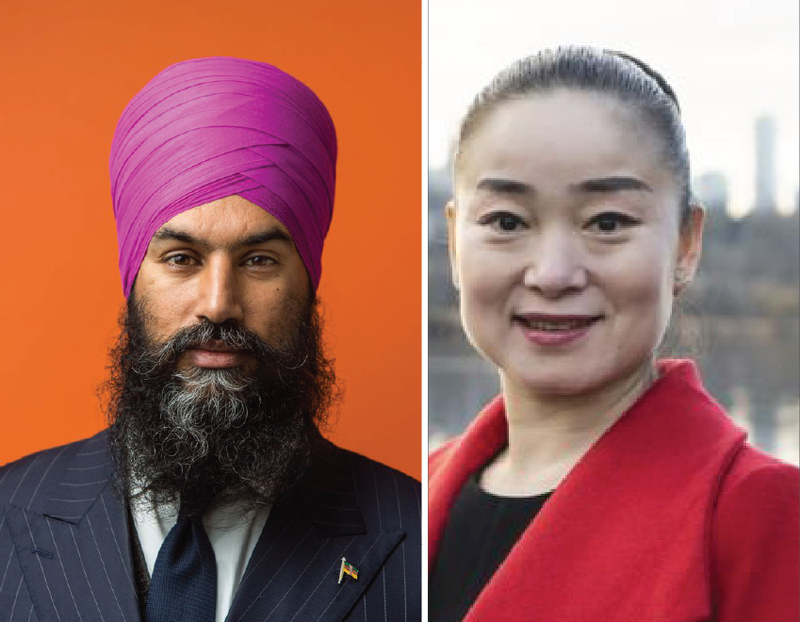 Jagmeet Singh said, “I intend to represent everyone, whether their background is Korean, Sri Lankan, Chinese, European, Japanese, South Asian, Vietnamese, African or Indigenous – anyone who calls Burnaby South their home,” he said. The byelection is scheduled for Feb. 25,2019. This is not the first time candidates have approached voters with an appeal using the race card. Back in 2008 another Liberal candidate Wendy Yuan candidate for Vancouver Kingsway riding put an ad which appeared in Sing Tao describes Yuan as a successful entrepreneur who will cut taxes and who speaks Chinese. Don Davies was described as having a union background who will increase taxes and who doesn't speak Chinese. The ad firther stated "Please unite on 10/14 and cast a vote for our Chinese community candidate, Wendy Yuan." Yuan's campaign however denied taking responsibility for the ad and insisted it was bought by a third party. "….let us be very clear that this was a 3rd Party Ad and it was not published by the Wendy Yuan campaign. We did not authorize it and had no prior knowledge of it." Daniel Louie, a pastor at nearby Urban Village Church was not happy with Wang’s comments. Other residents also took to twitter to raise their concerns.